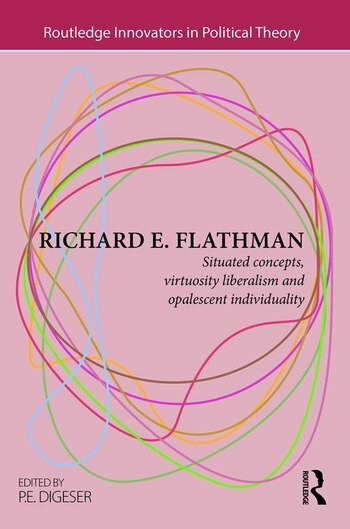 Richard E. Flathman is a ground-breaking theorist of key political concepts, a fierce defender of individuality, a close and original reader of Hobbes and an advocate of a willful conception of liberalism. In this volume P E Digeser draws together some of his key works. The collection is framed by an introduction and an interview with Flathman, where he reflects on his contributions. By thinking through and with Wittgenstein’s later philosophy of language, his work clarifies and refines terms that are central to politics and to the tradition of political thought. His work also seeks to cure certain persistent muddles and confusions in our political concepts as well as create and defend a space for the opaque and opalescent features of ourselves. Flathman advances a liberalism that is more open to and celebratory of the idiosyncratic as well as to voices not ordinarily associated with the liberal tradition. The final part presents selections that illustrate his conception of liberalism and individuality. Helping to highlight how the innovations in Flathman's thought have shaped the field of political theory, this collection will be of interest to students and scholars. P.E. Digeser is Professor of Political Science at the University of California, Santa Barbara. She is the author of Our Politics, Our Selves? (1996), Political Forgiveness (2001), and Friendship Reconsidered: What it Means and How it Matters to Politics (2016).